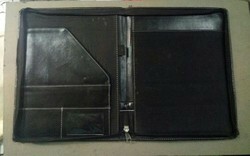 With our years of experience and knowledge, we are engaged in offering an excellent range of PU Leather Office Folders. Our provide office folders are known for their classic designs, fine finish and smooth texture of the exterior. These office folders are designed under the direction of our experts using progressive techniques & finest quality of leather. Offered office folders are stringently tested by our quality controllers against assorted quality parameters. To meet variegated demands of our esteemed clients, we are engaged in offering a wide range of PU Leather Folder. The given PU folder is high on demand in the market for keeping certificates & all confidential items. 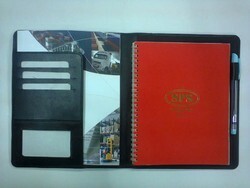 This PU folder is accessible in diverse sizes and customized options so as to meet the needs of customers. Provided PU folder is designed using quality approved material in tune with modern industry defined norms. 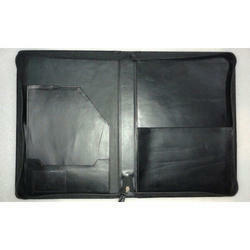 Our organization brings forth an exclusive array of Business Leather Folders made out finest quality graded leather. These optimum quality leather folders are highly appreciated for their classic designs, fine finish and smooth texture of the exterior. Under the expert supervision of our quality auditors, these folders are crafted by skilled group of artisans.